Just giving 2 people praise recently saved me £140. Ok thats not going to make me rich but it did make me think about whether praise has a direct impact on our ability to influence an outcome. In both cases, a parking ticket and an overdraft charge, I was in the wrong. I wouldn’t normally take the time to contest or complain, I just don’t have the patience or the inclination but on both of these occasions I thought it was worth a conversation at least. I called Lloyds Bank and Bath City Council and explained both situations very calmly and logically. Half way through I was stunned at the customer service skills of both reps so I praised them. I was quite specific in my praise – how they listened, how they empathised, how they had been open to my feedback. I then said ‘whatever the outcome I want it put on record how good you both are at your jobs.’ That feedback was genuine so I don’t think it was a conscious tactic to get my own way, although with 20 years of sales training I couldn’t say that for sure! I did honestly think they had done a good job. In both cases the reps seemed genuinely surprised at the praise I had given them. I wonder how many times they get praised? By their managers? by customers? By people making a complaint?! In both cases, having put my feedback in writing and naming the reps I had spoken to, I got my money back. This has got me thinking. If we praised what we want more of e.g good behaviour from our kids, excellent performance from our people, a high level of service from the recruiters we deal with, would we invite more of the good into our lives. 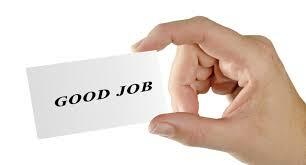 Some would say that you shouldn’t have to praise people for doing their jobs and I agree. But there is doing your job and going out of your way to do the best job you can do. Perhaps if we praised more, then people would feel like they want to go above and beyond. With this in mind, I am sick to death of reading recruiter bashing posts. There is bad service in every industry. But there is also good. Perhaps if we shone the light more on the people who have added value, then we will get more of what we want and not what we don’t want. I for one would start reading articles again on LinkedIn and feel like I want to contribute to positive conversations. So who can you recognise today?